Historian's visit to site where E. A. Westbury one is D.C.M. in which Ellesmere Westbury won his D.C.M. "I was fortunate enough to find myself on the Somme. In between visiting various places I thought I would go up to High Wood to view the ground where Elesmere fought. I had orginnally thought that the 1st Battalion, The Gloucestershire Regiment (to whom Elesmere belonged) had fought in High Wood itself. However, I do know now that they were involved in fighting to the left of the wood, in the hope of attacking the western approaches of the wood itself. Looking out from High Wood towards the British support trenches (where 3rd Brigade HQ was located). 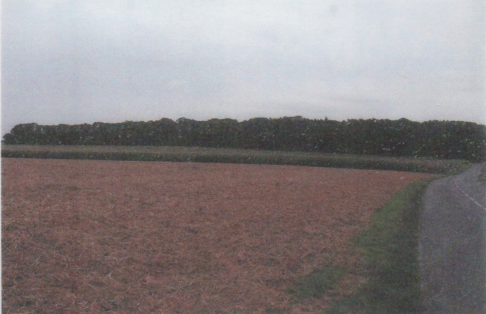 The British front line lay in the wood behind and was attacked by men of Z/Welsh Regiment, 8 September 1916. In the distance can be seen the village of Absenting-Le-Petit. 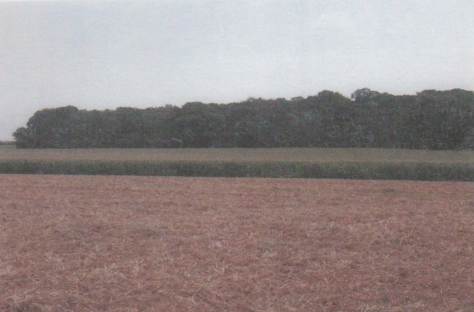 A row of trees in front and to the left marks a sunken road which was often used by signalers. In his memoir 'old soldiers never die', Frank Richards recalls the dangers of getting messages between the lines. 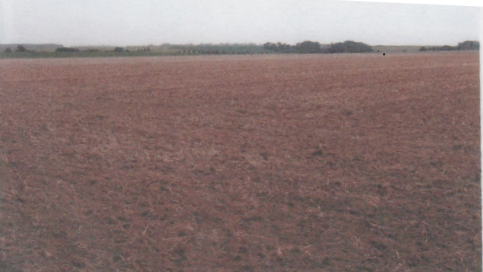 This ground saw the deployment of a very old and a very new weapon on 14 July. 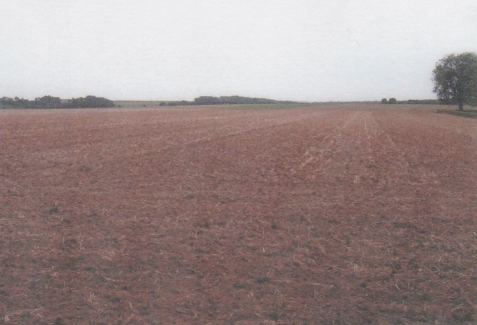 Two regiments of cavalry attacked over the ground to the left and the east High Wood. 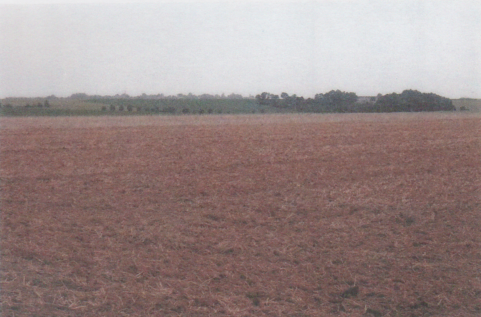 On 15 September tanks were used for the first time, moving up on the ground to the left to attack High Wood. Taken at the western corner of High Wood on the site of the German front line. This was part of the attack by 1st Gloucesters on 8 September 1916. German front line (on line of crops) and High Wood. The western approaches to High Wood attacked by 1st Gloucesters. This British front line was across the road to the right and the German front line lay just in front of this wood. The 'switch line' led directly up to the wood on the left hand side. The north-west (left hand) corner of the wood was heavily fortified by German machine guns. It was across this no-mans land (to the right) that Elesmere had to cross and where the 1st Gloucesters 'had to winkle the enemy from wired shell holes at bayonet point'. (The wood being attacked by 2nd Welsh Regiment). The German front line they were attacking, on 8 September 1916, skirted the edge of the wood and part of the road that ran along the bottom before curling back to the north and connecting with the strongly fortified German second line - known as the 'switch line'. A communication trench connected the front line in the wood to the 'switch line' and was in the path of 1st Gloucesters attack. Although there was no trenchers in the wood in tat area, the Germans had strongly reinforced the north-western part with machine gun teams hiding in shell holes and amongst the shattered tree stumps. The wood in September 1916 could have barely have been recognised as such. Few trees stood, and those that did had been stripped of all foliage and branches - resemble matchsticks. The ground was littered with scrub, broken branches, tree roots, shell holes, barbed wire and the detritus of previous battles. It was perfect terrain to defend and appalling to attack across. The trenchers held by 1st Gloucesters were to the east of the German front line. At 12.00 on 8 September the 1st Gloucesters, moved up to the front line. The logistics of moving up such a large number of men (a battalion's strength on the Somme was around 800 - 1000 men) in such narrow confines were extremely difficult and they had trouble assembling in the front lines. Overworked gun crews and worn down guns led to inaccuracies in shelling and the troops were at times shelled by their own guns. The bombardment of the enemy trenches began at 4.50pm, with the attack due to begin at 6.00. At around 5.00 o'clock communications with brigade headquarters was broken. Communications problems were often a feature of war on the western front. Telephone lines were often severed by enemy shell burst and contact had to be made using traditional methods such as semaphore or messenger (not an enviable task to perform in the middle of a battle). 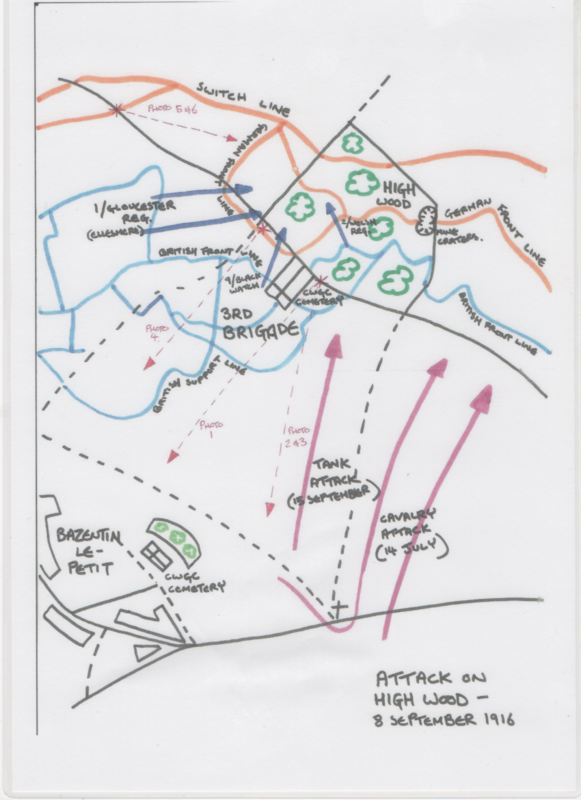 With brigade headquarters being responsible for co-coordinating the attack of the three battalions at High Wood, on 8 September, it was vital that communication was maintained. It was for this that Ellesmere was awarded the DCM. At 6.15pm the men of the Gloucestershire Regiment went 'over the top'. As with most actions during the Somme campaign, the troops managed to successfully capture the German front line trench. 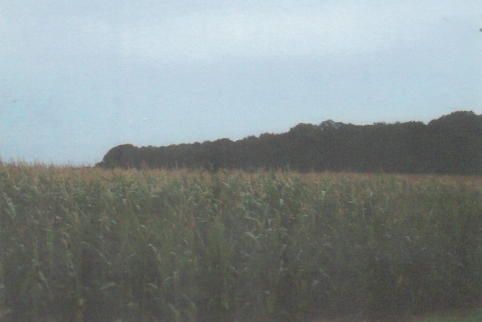 The problem came with the battalion's attempts to attack the wood itself. Marching gun fire from the wood and front line 'switch line' to the north led to heavy casualties and the Gloucesters were forced to retire to the German front line. At 7.40pm the Battalions war diary records that the senior officer in command, a Captain Baxter, sent a message back calling for more reinforcements to replace their losses. Elesmere, it is my belief, was one of those who was tasked with carrying a message back to the British lines. This was an extremely dangerous task, indeed, and one which all too often led to death of the unfortunate man whose task it was. The citation for Elsmere's DCM award in the London's Gazette states that he "enabled touch to be kept with headquarters, when telephone wires were broken and could not be repaired". Whether or not it was battalion or brigade headquarters, I am not sure. Of course contact with brigade headquarters was broken even before the attack and it seems likely, to me, that Elesmere would have made some contact. The brigade headquarters as a result (which would have taken him east, across the attacking frontage to 3rd Brigade HQ which would have roughly been located in the field due south of High Wood, behind where the war cemetery now stands (Photos 2 & 3)). Heading back to the British lines would have involved crossing the exposed no-man's land between and the curtain of shell fire designed to isolate an attacking force and prevent reinforcements from reaching them. Messengers were also targets for machine gunners and snipers who would've been instructed to look out for, and prevent messengers getting back to their own lines. Once back in the British trenches, Elesmere would still have been subjected in German artillery targeting supporting troops waiting to involve themselves in the attack. Indeed during an attack progress through one's own line could be difficult, having to work your way through trenches congested with troops bringing up supplies and taking away the wounded. Progress would have been slow of course, when an answer was obtained the messenger would have to go back! All in all, Elesmere did this "four or five times a day" during the attack. At 7.45pm with no reinforcements available, Captain Baxter ordered a withdrawal back to the British front line. The story was generally repeated across the attacking front in the early hours of the morning of 9 September. The Germans counter attacked but, despite heavy shelling, the line was held by the Gloucesters. Having been under strength going into the attack (perhaps even somehow between 400-600 men). Only 3 officers and 96 were left standing when they were relieved 2 days later. His citation records that Elesmere Westbury was awarded the DCM for "lengthy operations" during this period. His action on 8 September 1916, it would seem, was more than just a 'one off'". In 1916 Elesmere was 18 years old.